I went the extra mile for Palmer because it was in an awkward position on the UK market and I think it is a seriously underrated, truly high-quality Champagne producer that deserved unfettered distribution here, where Champagne is appreciated more than in any other country, with the exception of France itself. If I was delighted when I eventually persuaded Vervier to enter the Decanter World Wine Awards in 2012, my last year as chair of its Champagne panel, you can imagine how I justified I felt when Champagne Palmer 2006 Blanc de Blancs won Best Vintage Champagne Trophy and the International Trophy for Best in Show Sparkling Wine. While writing the trophy-winner profile, I asked Vervier if he had a UK distributor. To cut a long story short, he told me that Champagne Palmer had been with a UK importer for more than 15 years, but they had recently taken on a cheaper brand, which had significantly affected sales. Vervier felt neglected and was seeking a new distributor in the UK. Now they have Bibendum and I’m not sure who has the best deal, the bloody good distributor or the bloody good Champagne? In my Christie’s World Encyclopedia of Champagne & Sparkling Wine I wrote “Palmer also has one of the best reputations among the Champagne houses – hard-won respect, considering they have to deal with co-ops on a continuous basis.” That is true, but the whole truth is more interesting. In the good-old, bad-old days, when sur lattes was much more widespread than it is today, Palmer was always the first choice of a number of grandes marques whenever they ran out of a vintage. Even the lowest quality sur lattes can be slipped into the distribution of a non-vintage brut without attracting much attention, particularly if it gets shipped to one of the less sophisticated markets, but a vintage is by definition a Champagne purchased almost exclusively by experienced consumers. Famous names must be very careful if they are going to buy in ready made vintage Champagne. They shouldn’t be allowed to do this of course, but it remains a legal, if deceitful, practice (unless sold as “Selected by”). Some very famous names have always resorted to it, whereas some never have, and those with distinctively shaped bottles obviously have no choice in the matter. Based in Reims, Champagne Palmer is a cooperative and technically known as ‘Société des Grands Crus de la Champagne’ because only owners of grand cru vineyards were allowed to join when this collective was established in 1947. The seven founding members tried in vain to make an acronym from their initials, and were at a loss what to do when they were inspired by a packet of Huntley & Palmer biscuits. Honestly! Huntley & Palmer had been particularly popular brand in France ever since the company had been awarded a warrant from Napoléon III in 1867. Having been deprived of imports during the war, the late-1940s Rémois were prepared to pay more for a packet of Huntley & Palmer’s biscuits than a bottle of Champagne. The original seven founding members began debating whether they should capitalise on that popularity? They could not rip-off the brand in full, of course, but why choose Palmer rather than Huntley? Probably because Champagne Palmer rolls off the tongue much easier than Champagne Huntley. God forbid that anyone should think that the founders had even heard of a certain château in Bordeaux, let alone allowed that to influence their decision, but inevitably the emergence of Champagne Palmer did not go down well with the owners of Château Palmer, and so began a protracted exchange of letters. However hard the seven growers tried to placate Château Palmer, the problem just would not go away. Until, that is, they sent a case of their Champagne as a peace offering and apparently the owners liked it so much that they dropped all objections. The matter has not been a problem since! Although originally established by seven growers in Avize, most of their vineyards happened to be located in the grands crus of the Montagne de Reims. 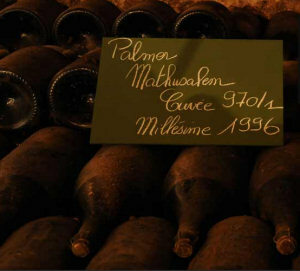 In 1959 Champagne Palmer moved to Reims, where it now has over 200 members, who own 365 hectares of vineyards spread across 40 different villages. These vineyards are still dominated by the Montagne de Reims, albeit premiers crus as well as grands crus, now that membership is no longer restricted to growers with the latter. Vervier told me that new members “still have to recommended for their quality by current members” and while this might be viewed by some as meaningless waffle to gloss over a downgraded membership, I would in fact go further than Vervier and insist that the lowering of Palmer’s membership requirements has been instrumental in building one of Champagne’s greatest cooperatives. 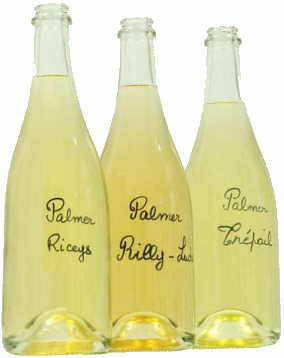 Half of Palmer’s vineyards are planted with Chardonnay and half of this is spread over just two premiers crus, Trépail and Villers-Marmery, on the eastern Montagne de Reims. Everyone knows that the Montagne de Reims is classic Pinot Noir country, but the greatest Pinot Noir is found two pairs of neighbouring villages, one on the northern montagne (Verzy and Verzenay), the other on the southern montagne (Bouzy and Ambonnay). What exists between these two pairs is always a bit of a surprise for wine lovers touring the Montagne de Reims for the first time. Driving between Verzy and Ambonnay, almost all the vines are Chardonnay, and there are close to 500 hectares in total. The style is very different from that of the Côte des Blancs. It is not better, but it is very special and when blended with about 20 per cent Sézannais Chardonnay in magnums of the best vintages from Palmer, it can equal some of the greatest blanc de blancs from the Côte des Blancs. Montagne Chardonnay has an emphatic minerality, but it is less chalky. The fruit has more body and structure, without any appreciable gain in weight. The aromas are more creamy, with less white flowers and citrus. I hope that Bibendum decides to ship the Champagne Palmer Blanc de Blancs in magnums and manages to offer a limited volume of older vintages that I know exist in the cellars, but it was the current 2006 Champagne Palmer Blanc de Blancs in regular 75cl bottles that won Best in Show at the Decanter World Wine Awards in 2012, so you are onto a winner, whatever the year or bottle format.